But, Maximum Milk Thistle is the only clinically-tested brand of milk thistle available in the USA. For this reason, Maximum Milk Thistle is the only milk thistle brand listed in the Handbook of Clinically Tested Herbal Remedies. Maximum Milk Thistle is also the most potent of all milk thistle formulas. This is because its patented formula gets up to twenty times more liver protection power into your bloodstream. Dr. Michael Murray, leading natural health expert and author, Encyclopedia of Natural Medicine. And You Can See The Medical Studies That Prove It! When you can use a scientifically tested and clinically-validated brand like Maximum Milk Thistle to protect and support your liver, why would you choose one that was not? How would you know what safety and effectiveness you are getting from an untested and unproven formula? Why would you take a chance with unproven products when it comes to your health and well being? 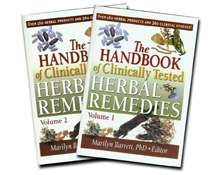 The Handbook of Clinically Tested Herbal Remedies is the reference tool you need to distinguish those herbal products that have been clinically tested from those for which there is little or no real evidence that substantiates or disputes their claims of efficacy. Published in 2004, this essential volume provides a snapshot of 160 herbal products that have been tested in clinical trials. Details of the products and the clinical trials they underwent are here in an easy-to-read, at-a-glance format. Not only does this book list proprietary herbal products that have been tested in controlled clinical studies and provide a rating of the quality of those trials, but, it also describes the fundamentals of herbal medicine, including regulation, characterization, standardization, bioavailability, efficacy, safety, pharmacopoeial monographs as well as incentives, or lack of incentive, for US and European manufacturers to conduct clinical studies. Maximum Milk Thistle and its manufacturer, Natural Wellness, are listed in this book. And you can buy Maximum Milk Thistle directly from Natural Wellness right here from this website. The only two other milk thistle products listed are 80% standardized extracts that are available only in Europe. In fact, the German product, Legalon, is the same one Maximum Milk Thistle was tested against in clinical studies where Maximum Milk Thistle was shown to be eight to ten times more absorbable. The active ingredient in Maximum Milk Thistle) is a complex of silybin combined with phosphatidylcholine containing 29.7 to 36.3 percent silybin. An initial pilot study was conducted on a product with a molar ratio of silybin to phosphatidylcholine of 1:1 (Buzzelli et.al., 1993). The current product is manufactured with a ratio of silybin to phosphatidylcholine of 1:2. Sold in the United States under the name Maximum Milk Thistle by Natural Wellness. Two double blind, placebo-controlled studies were conducted with (the active ingredient in Maximum Milk Thistle), a milk thistle extract (silybin) combined with phosphatidylcholine. A well conducted study with 65 subjects with chronic persistent hepatitis proven with a biopsy were treated for three months with placebo or 240 mg silybin (720 mg Maximum Milk Thistle) per day. As a result, a statistically significant reduction in serum aminotranserases (AST and ALT) was observed in the treatment group compared to placebo (Marcelli et al. 1992). In a short pilot study, 20 patients with active viral hepatitis due to hepatitis B and/or Hepatitis C were treated with either 480 mg silybin (1440 mg Maximum Milk Thistle) or placebo for one week. A significant decrease in serum aminotransferases (AST, ALT, and GGT) and bilirubin levels was observed in the treated group compared to the placebo group (Buzzelli et al., 1993). There are other clinical studies available, but only these two are referenced in this book. In the book there are also studies showing the effectiveness and safety of regular 80% standardized milk thistle extract. It is important to note that the only difference between 80% standardized milk thistle and Maximum Milk Thistle is that eight to ten times more Maximum Milk Thistle gets into your bloodstream to protect and support your liver (as also shown in published clinical tests). Anthony Almada, MSc, founder and Chief Scientific Officer of IMAGINutrition, Inc.
Roy Upton, Executive Director of the American Herbal Pharmacopoeia. The reviewers of the clinical trials included: Karriem Ali, MD; Richard Aranda, MD; Elliot Fagelman, MD; Mary Hardy, MD; David Heber, MD, PhD, FACP, FACN; John Trimmer Hicks, MD, FACP, FACR; Hannah Kim, MD; Franklin C. Lowe, MD, MPH; Richard D. O’Connor, MD; Barry S. Oken, M.D; Lynn Shinto, ND; and Keith Wesnes, PhD.